In this year’s final series of park reviews, we discover the best and the worst of our local green spaces. The best, exemplified by Christie Pits, feature wide open spaces, fields and courts, playgrounds and swimming pools, all of which are well maintained. The worst can be summed up with one word: neglect. 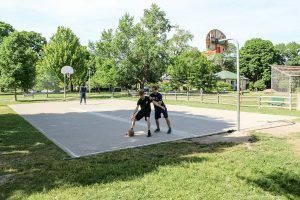 We highlight Robert Street park in particular, as it earns the dubious distinction of earning an F grade for the fifth year in a row. Equally disappointing is Euclid Parkette, which resembles an abandoned laneway in a B-grade thriller movie. We hope these spaces will get some attention in the near future, but aren’t holding our breath. Reason to go: Located between two houses on Brunswick Avenue, smallish Sally Bird Park looks more like a very nice garden with a concrete walkway than a park. Ideal for getting away from the noise of the world, it seems designed for solo visits or couples looking for a break from the city’s buzz. The serene air complements the few benches, while two separate sets of workout equipment make Sally Bird a great spot for a low key workout. The City of Toronto has some work to do here — the water fountain, wall, and garbage bin have been recently vandalized with graffiti. Overheard: Just your own voice…accompanied by chirping birds. Did you know: The concept for outdoor workouts originates from the Great Depression, when it was feared the population’s physical fitness would decline because of a shortage of money. 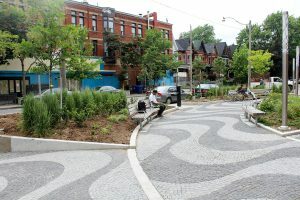 Reason to go: Reopened last year with a new name, the Doctors’ Parkette (formerly Brunswick-College Parkette) has maintained its stylish and neat look. Shaped like an almond and surrounded by young trees, the park mixes concrete and greenery with aplomb. With plenty of seating, it’s a perfect spot to rest where Brunswick Avenue and College Street intersect, and we hope the park stays that way. Overheard: “He just shot at him!” said a man while having an excited conversation with a friend about a movie. Did you know: The Harbord Village Residents’ Association (HVRA) Brunswick-College design competition received 27 submissions from eight countries. The final design was chosen by HVRA members at the spring 2012 meeting. Reason to go: Balance. This park is one for everyone. Vermont Square Park is large in size with enough space for picnics, walks, seating, and shade from the plentiful trees, as well as a playground for kids. This active park has an air of excitement from kids playing and dogs gambolling about in the off-leash area. Even with the middle of the park undergoing maintenance to fix compacted soil and drainage issues, the park remains a must-visit. Did you know: The playground is named for Dennis Lee, Toronto’s first poet laureate. Reason to go: Climbing the stairs from Davenport Road means Hillcrest Park can be a bit of a hike, but it’s worth every calorie burned. With three tennis courts, a stone tennis table, and a basketball court, Hillcrest has a clubhouse atmosphere. There’s also a large sand playground and wading pool. It’s a vibrant, well maintained park made for enjoying the moment. You can even lie on a blanket on the hill, admiring the city’s skyline while listening to the hum of the cool summer breeze. Overheard: “I swear I touched it!” If only the attempted block had prevented the basket. Did you know: Lake Ontario can be seen from the edge of the hill. Reason to go: Officially reopened last October after a renovation, Margaret Fairley Park has a playground that looks like Tarzan’s treehouse. Well-positioned chairs beneath the shade of large trees provide a spot for lounging on a hot day, and the wading pool offers a place to cool off as the temperatures soar. This is an ideal space for a walk, a romantic oasis, and a spot for families and kids. Overheard: “Go! Go! Go!” A mother laughed recording her dancing toddler son. Did you know: Margaret Fairley Park, named for the writer, activist, and educator, first opened in 1972. Reason to go: Space. Even with half of the park closed for renovation, the other half is comfortably as large as any other park, if not larger. An island in a sea of cars, it is full of large trees that shade everything except the statue of King Edward VII, which basks in the glory of the sun. The park’s many paths can make it seem like an urban maze featuring campers in tents, university students, cyclists, and grandparents minding their grandchildren. The grass is well trimmed, and the monuments — when not being renovated — are a thing of beauty. In fact, the renovation is the only reason the park remains a B+. Overheard: “You’re going to sign for the Blue Jays?” A group of women teased a child as he played baseball with his dad. Did you know: The renovation started March 12, 2018, and will run till October before the other half goes under renovation from October till August next year. Reason to go: None. We’ve graded this park an F for five straight years, and nothing has changed. There’s been no attempt to make it an asset for the community. All the courts, rinks, and facilities are slowly falling to pieces while a perfectly good playing field is locked off to the public. In January, we published an open letter by Nicholas Provart about the park’s history and the need to bring it back to life. Apparently, that has fallen on deaf ears. Overheard: Nothing. Not even ghosts come to this park. Reason to go: DON’T. This is an eyesore. Only the ironically neat and new-looking city sign reading Euclid Parkette signals that this semi-abandoned walkway is actually a city-owned park. Unkempt, overgrown clumps of grass and flowers grow on either side of the dusty path that trails through the small park, decaying banana peels decorate rusting chairs, and flies buzz around waste from fast food restaurants, as if to add to the aura of decay. Bugs are the only thing attracted to this wasteland. Overheard: Unintelligible conversation a man was having with himself as he walked by the sidewalk beside the park. Did you know: Euclid Parkette is just a few blocks away from Christie Pits, one of the best parks in the area. Seriously, don’t go here. Reason to go: Located in a quiet neighbourhood, Healey Willan Park is perfect for children. At its heart is a large wading pool that is surrounded by chairs. The park is full of toys, and there are two playgrounds, one with playhouses and the other with swings and rides. Conducive to a quiet conversation or brooding alone, the park does need some work — there’s litter on the grass, aging toys that need to be replaced, and sand that should be cleared from the wading pool. Did you know: Healey Willan Park is where the Sisters of the Church convent was once located. 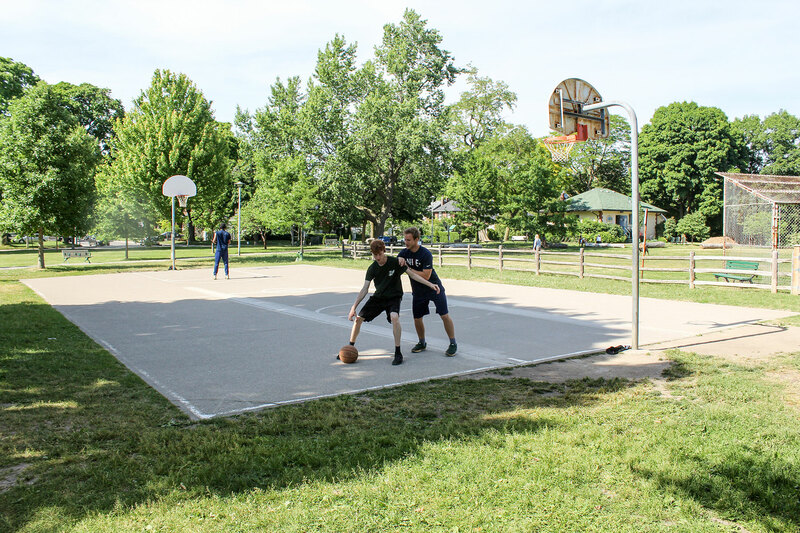 Reason to go: Home to a basketball court, two baseball fields, a swimming pool, and a playground, Christie Pits is one of the area’s best parks. There’s lots of hills (for sledding in the winter), trees, benches, and pretty flowers. This is a spot for getting active, and just as easily a spot to relax. With so much to do, there’s always people in the park, and many community events are hosted there. In fact, it’s not unusual to light upon an impromptu musical jam, or even a pick-up game of basketball. Overheard: “Okay now watch me hit this hill!”—Skateboarders, shooting a YouTube video. Did you know: You can watch a different film every Sunday night in the summer courtesy of the Christie Pits Film Festival (christiepitsff.com).